Posted byPaul Marfell	 September 5, 2017 September 7, 2017 2 Comments on Concentrating on “Wow!” gives me a blurry Kingfisher? In a previous post (Roe Deer with Aperture Priority) I talked about setting ISO and aperture to stop the camera insisting on using a high shutter speed with my long lens (a Sigma 150-500mm). Given half a chance my camera (a Canon 7d) will insist on using 1/500s or higher. The resultant large aperture and high ISO then give fuzzy and noisy images. However, when shooting wildlife with a long lens you can only go so slow before you start running into problems. On Sunday I went to Adel Dam Nature Reserve and had been taking photos of Kingfisher on the branches in the lake. The light was not good but the exposure wasn’t too bad. 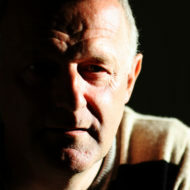 I had to crop the images and considering the distance I was reasonably happy with the results. 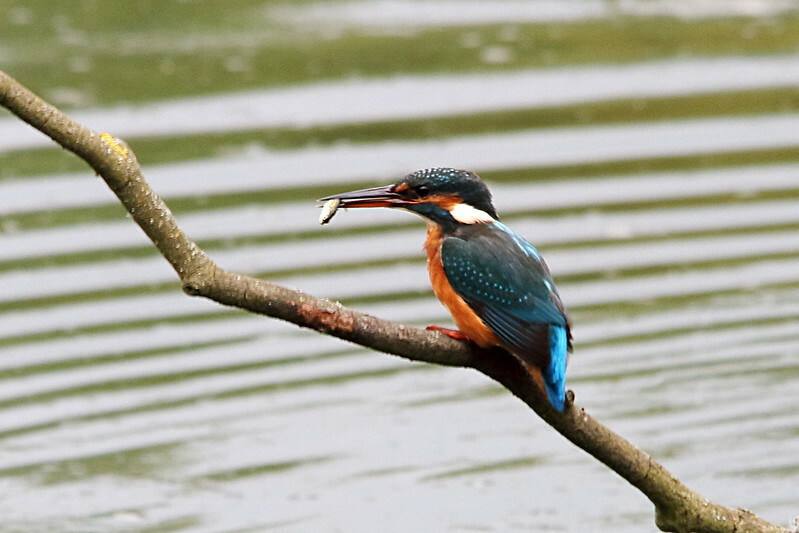 The photo above shows the Kingfisher about to shake the fish and bang it on the branch before swallowing it. This is cropped so I am reasonably pleased with it. 1/180s, f8, 800ISO, 403mm. 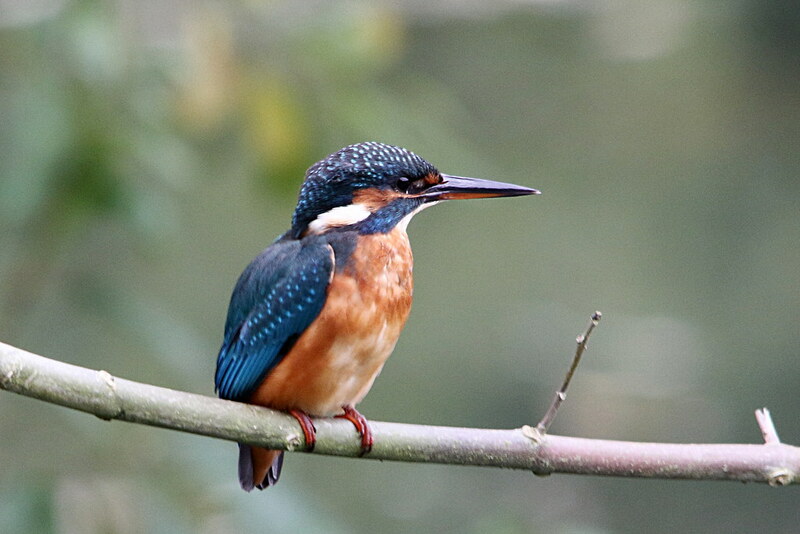 But then one of the Kingfisher came close. It perched on a branch to the side of the hide. Unfortunately it was slightly in the shade. I had to be quick to move to the side window of the hide then frame and focus on the Kingfisher and didn’t really look at what the light was doing. Before image stabilisation came along the rule was that you would use a shutter speed that was the inverse of the focal length. So at 500mm on an APS-C camera the rule tells me to use 1/(500 x 1.6) or 1/800s. Looking at the EXIF data of the image shows that I used f8 and 800 ISO as in the previous image. These settings should give me a good quality of image as long as the subject was still/fixed in the frame. But 1/45s was just too long, and it shows. The branch would have been moving and that kind of shutter speed with a focal length of 500mm means that I was really lucky to get anything recognisable. I think it is good but it should have been better. You should be able to see the individual barbs on some of the feathers on the wings but it is actually quite blurred. I think it is obvious that the cause is camera shake and subject movement. So what could I have done? What will I try to do next time? The first thing was to look at what settings were being used. Were they the best to use? No? What would be better? How could I get the camera to use a faster shutter speed and do it quickly? With my finger on the shutter release the easiest thing to do would be to dial in some underexposure with the back dial. Shooting in RAW should let me under expose by a stop without losing much colour and detail. In fact, now that I think about it, why didn’t I do that for all the shots I took? Almost as easy would be to use my index finger to dial in a larger aperture before going back to the shutter release. The next thing I could have done was to use my index finger on the ISO button and then on the wheel to dial in a higher ISO. Frame, focus, take a shot, review settings. Dial in 2/3 stop under exposure. Take a shot. Dial in f6.3, take a shot. Up the ISO to 1600, take a shot. But instead I was looking through the viewfinder at a gloriously coloured Kingfisher and thinking “Wow!” I didn’t want to take my eye off it to review camera settings. If it had stayed on the branch a few more seconds I might have started looking at the camera but it was great to get such a view. It would have been good to get photos at several shutter, aperture and ISO combinations for me to review later. This would all help me to get a better understanding of the settings to use for a given situation. Practice, practice, practice. At the moment I am guessing that I could have tweaked the settings to get a better image. What it means is that I have to keep reviewing my results after the event and practising so that these things become automatic without them distracting me from enjoying the sight. Longer term there are a few other things that I could do. Upgrade my lens to one that gives better image quality at larger apertures. The Canon 400mm f4 prime seems to give good results and is not a daft price. Or I could upgrade my camera body to the Canon 7d Mk II which gives better quality images at higher ISO. There are rumours of a Mk III being announced in the first half of 2018. Really interesting post (and great shots too, I love your posts). I’m no photographer, but I’d be tempted to fire off several shots and stack in Photoshop? Maybe a different way to kill a bird with three shots?